From our December visit to Tikal …. 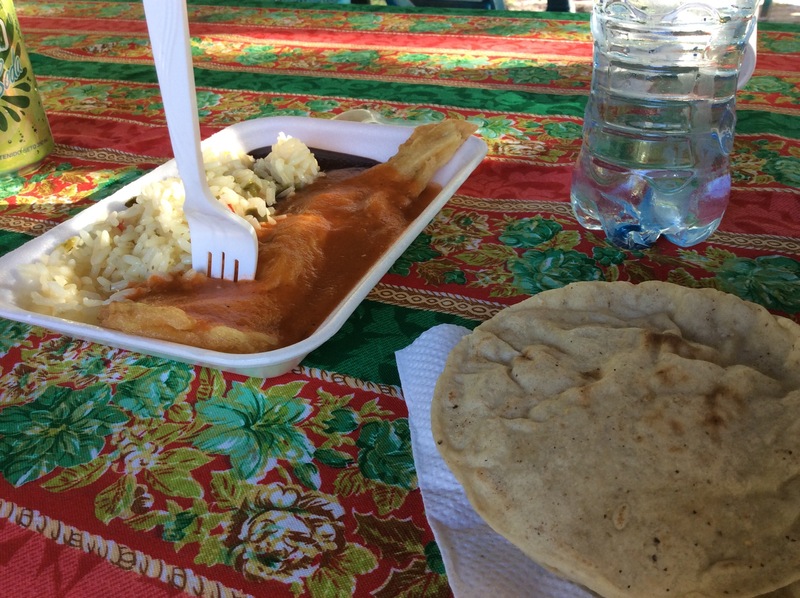 Outside the Tikal ruins park were several small food vendors. They were set up in the shade off the parking lot, each with a few plastic tables, coolers, and an antique-looking press of some kind that turned out to be a shaved ice machine. 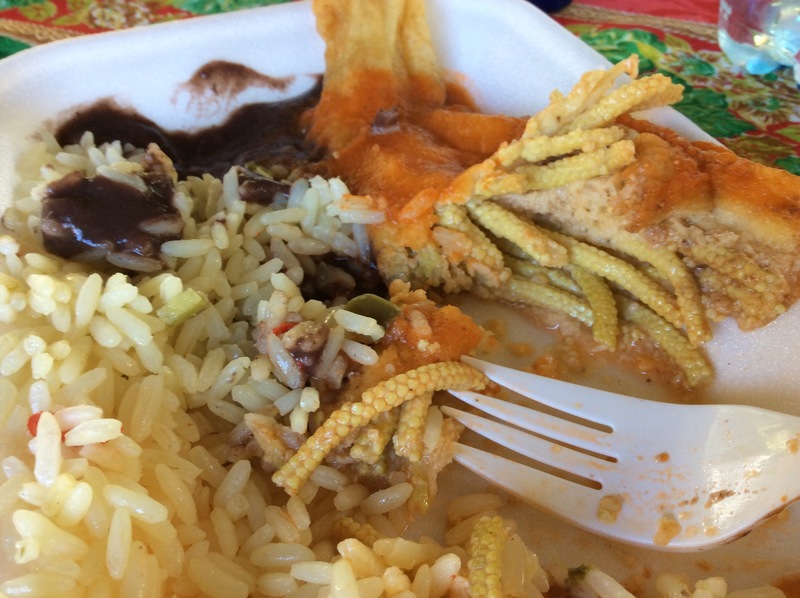 We decided to buy lunch from a lady with plastic bins of food: chile relleno, fried chicken, beans, rice, and pacaya. Not being meat eaters, I inquired as to whether the chile relleno were “sin carne,” but also that had a little pollo in them. So we each ordered a pacaya (which she assured me was “vegetariano”) with rice and beans. I got a bottled water and Tim had a lemonade soda. She dished up our food from her Tupperware-style bins onto styrofoam trays and carried them over to a table covered with a flowered plastic table cloth, along with some homemade tortillas. We dug in. I had no idea what a pacaya was, but it looked kind of like a chile relleno, covered with an egg batter and fried. I had difficulty cutting it with my fork but when I finally made it through the skin or peel, it looked an awful lot like worms or strands of narrow corn cobs. Hm. Tasted kind of like corn as well and I attacked with my plastic fork and ate it. Once I had access to Wikipedia, I discovered that pacaya is the undeveloped male parts of a certain type of palm tree. Here’s to eating unkknown stuff! Buen provecho! This entry was posted in Travel and tagged Guatemala, pacaya, Tikal on January 27, 2015 by czelazek.